Read our preview of the upcoming college football season in this special section. When Tracy Cracraft sent her son, River, off to play football at Washington State, she never knew she’d see him on the field so often his freshman season. And she didn’t realize how little she’d see of him off the field the rest of the year. Because at a Pac-12 football program, the season may end in December but the time commitment is year-round. The 2014 season begins early for the Cougars with a game against Rutgers on Aug. 28, but in reality this season began the moment the last one ended. Players at WSU also get one week off in August before fall camp. Even during those few periods when River Cracraft was home, he still had one foot back in Martin Stadium, doing whatever it took to build on the successes of his first year, when he was named All-Pac-12 honorable mention. Nearly every day back in Trabuco Canyon, Calif., he was calling anyone with an arm and a football to play catch with. Cone drills for footwork, lifting weights, running routes against imaginary defenders and even some extra conditioning filled River Cracraft’s and the other Cougars’ summers. Even when the team has practice, Cracraft can often be seen catching passes long after other players have gone in. 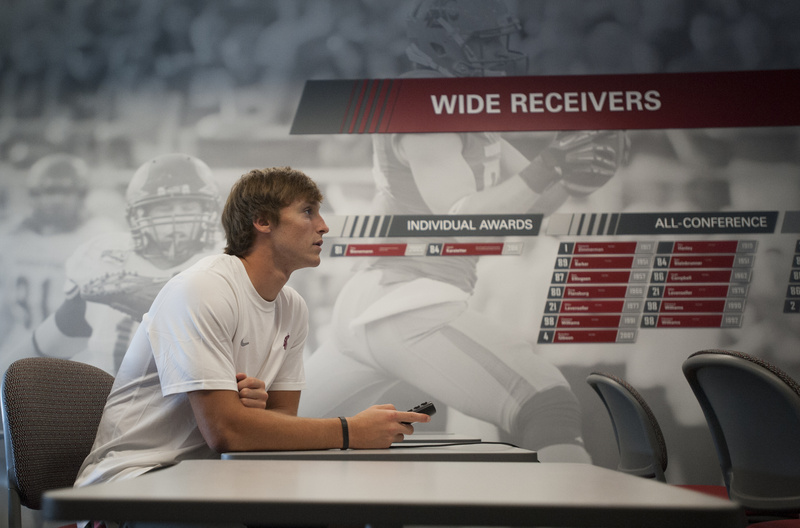 That hard work begat more time commitments, as strength coach Jason Loscalzo demanded that the team put to use all the ice baths and other recovery equipment in WSU’s football operations building. The building comes complete with a modern, football-only weight room. On Mondays, Tuesdays, Wednesdays and Fridays throughout the offseason the Cougars were lifting weights. Because they no longer have to share a weight room with other sports, the strength coaches have added to the workouts the players performed in the past. “We have that new facility so guys were coming in left and right doing extra work,” Loscalzo said. On the days when the Cougars don’t have organized team activities, they work. When they don’t work, they think about working. With the physical toll college football players put themselves through, the periods where the body is allowed to recover can be just as important. Even while resting, though, football is on the brain 24/7. The receiver gained an eager and familiar pupil this offseason when Skyler joined the Cougars as a walk-on defensive back despite not playing organized football since high school. River, two years his junior, has spent much of his offseason consolidating his own knowledge of what it takes to be a college football player by schooling his big brother. The amount of time spent watching what had happened compared to the amount of time actually doing it was a surprise. Skyler Cracraft joined the team after trekking to every game last season, something his mother will continue to do in 2014. In that way she can actually see her boys on a weekly basis, something that just isn’t possible during summer break.